The CBQF Analytical Chemistry Platform possesses dedicated specialized technical staff who are able to work with a range of instrumental analysis possibilities based on state of the art equipment and methods. Approaches are based on mass spectroscopic and spectrometry techniques, electroanalytical techniques, and flame detection methods. Spectroscopic techniques involve the absorption or emission of electromagnetic radiation by molecular or ionic species present in a sample, and may or may not be coupled to a chromatographic system of analyte separation. This platform is equipped with molecular absorption spectrophotometry in ultraviolet-visible (UV-Vis) with prior separation of analytes by HPLC: a Beckman model 126 quaternary solvent system, equipped with a System 32 Karat 5.0 software and a 168 rapid scanning, UV-Vis photodiode array detector, a Waters e2695 separations module equipped with a Empower 3 software and a Waters 2998 PDA detector, and a Knauer K-1001 solvent system equipped with a Clarity v.3.0 software and a K-2501 UV detector. For preparative analysis the platform also has a Knauer preparative pump 1800 with a dynamic mixing chamber solvent system equipped with a Clarity v.3.0 software and a Knauer 2800 PDA Detector with a fraction collector (Teledyne ISCO Foxy R1). These detectors are selective to chromophoric molecules (species that absorb energy in the UV-Vis). 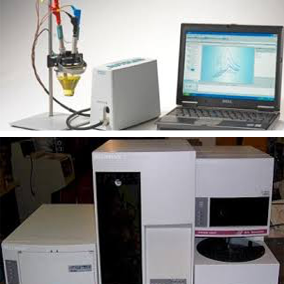 The platform is also equipped with molecular emission spectrophotometry (fluorescence) with prior separation of analytes by HPLC (a Beckman model 126 quaternary solvent system equipped with a System 32 Karat 5.0 software and a Waters 474 fluorescence detector), and a refraction index detector, with prior separation of analytes by HPLC. The fluorescence detector is a selective detector to natural or fluorescent molecules and/or molecules which become fluorescent after a derivatization reaction, while IR is a universal detector and useful for detecting molecules that do not absorb light and are not fluorescent. Determination of metals by plasma optical emission is also available in the platform. An Optima 7000 DV ICP-OES (inductively coupled plasma optical emission spectrometry) from Perkin-Elmer equipped with a WinLab32 software and a CCD array detector is available to collect a complete elements spectrum at speeds that far exceed competitive systems. Infrared spectroscopy is also offered in the platform and it is based on the vibrations of the atoms in a molecule, resulting from the passageway of radiation through the sample. Each absorption frequency corresponds to a frequency of vibration of a part of a molecule in the sample. A Perkin-Elmer Spectrum 100 FTIR spectrometer equipped with MIRacle™ single reflection ATR accessory is obtainable for analysis of solids, liquids, pastes, gels, and intractable materials. Electroanalytical methods are a class of techniques in analytical chemistry that study an analyte by measuring the potential (volts) and/or current (amperes) in an electrochemical cell containing an analyte. This platform is equipped with a potentiostat microAutolab Type III with an Autolab Faraday Cage able to run procedures related with voltammetry, amperometry, potentiometry, charge discharge, and impedance using a 3 mm glassy carbon (GC) disk working electrode or screen printed electrodes. Mass spectrometry is a technique that makes possible to determine the mass of atoms, molecules or fragments of molecules. This platform is equipped with mass spectrometers coupled to both gas chromatography (volatile compounds) and liquid chromatography (non-volatile compounds). The equipment available for gas chromatography with mass spectrometric detection are: a Varian CP-3800 gas chromatograph equipped with a Varian ion trap mass spectrometer Saturn 2000 (without an automatic injector), a Varian CP-450 gas chromatograph equipped with a Varian ion trap mass spectrometer Saturn 240 MS (with an automatic Combipal injector for liquids, headspace and solid phase micro extraction- SPME), and a Thermo Scientific Focus gas chromatograph equipped with a Thermo Scientific Polaris ion trap mass spectrometer (without an automatic injector). The equipment available for liquid chromatography with mass spectrometric detection is a Thermo Scientific Dionex UltiMate® 3000 liquid chromatography equipped with a Bruker Impact II Ultra-High Resolution Qq-Time-Of-Flight mass spectrometer (with an automatic injector). The new Impact II™ is the latest innovation in Bruker’s unique UHR-QqTOF mass spectrometry product line with industry-leading > 50,000 Full-Sensitivity Resolution (FSR). It opens up enhanced analytical performance levels for all applications where trace analysis from complex, high-background matrices is a challenge, such as biomarker research, identification of impurities or residue screening, proteomics applications, and small molecule applications. Flame ionization detectors (FID) interact with solutes eluted from gas chromatography (GC) columns to produce a current that varies in proportion to the amount of solute present. FID is sensitive to molecules that are ionized in a hydrogen-air flame, including most carbon-containing compounds. The equipment available for gas chromatography with flame ionization detection comprise: a Hewlett-Packard 5890 (without an automatic injector), a Varian Varian 3900 gas chromatograph equipped with a Varian CP-8410 autoinjector, and a Varian CP-3380 gas chromatograph equipped with both a FID and a olfactory detector outlet SGE ODO II. The flame photometric detector (FPD) is identical to the FID with the addition of an S or P filter and a photomultiplier tube. The optimized flame, which excites P or S containing radicals to HPO* and S2* species respectively, produce very characteristic emission spectra, giving maximum emission intensities at wavelengths of 526 nm for phosphorus and 394 nm for sulphur. The equipment available for gas chromatography with flame photometric detection is an Agilent Technologies 6850 (without an automatic injector).